Spotify is now 10 years old, and the company which popularized music streaming How to Pick the Best Music Streaming Service for You How to Pick the Best Music Streaming Service for You Do you use a music streaming service? If so, how do you know you're using the best one for you personally? Read More has taken the opportunity to look back over a decade of discovery. Which means lists of the most-streamed artists and songs, plus other milestones from the past 10 years. Daniel Ek and his Swedish cohorts launched Spotify in October 2008, having founded the company two years previously. Spotify soon spread from its home country of Sweden to the U.K., and then in 2011, Spotify was launched in the United States. Spotify is now available in 60 countries worldwide, and boasts hundreds of millions of users, millions of which pay for the privilege. In April 2018, Spotify started trading publicly, with its shares listed on the New York Stock Exchange. 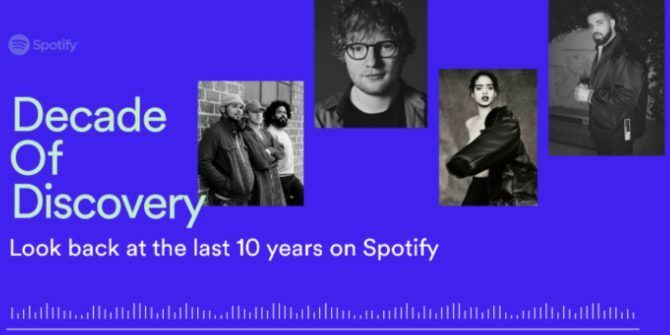 With 10 years under its belt, Spotify has decided to look back over what it terms a “Decade of Discovery“. And the statistics paint a fascinating picture of what we’ve all been listening to on Spotify between 2008 and 2018. There’s more to learn too. Such as Humans by The Killers being the most-streamed song in 2008. And the fact that Rihanna was the first artist to reach 1 billion streams. Or, most impressive of all, Spotify racking up 16,858,080 years in total time streamed. Given Spotify’s propensity to create playlists from the data it gathers, it should come as no surprise to learn there’s also a Decade of Discovery playlist. This is packed full of the most-streamed songs people have listened to on Spotify over the past 10 years. Whether you’re a Spotify veteran or a relative n00b, be sure to read our unofficial guide to Spotify Spotify Music Streaming: The Unofficial Guide Spotify Music Streaming: The Unofficial Guide Spotify is the biggest music streaming service around. If you're not sure how to use it, this guide will walk you through the service, as well as offer some crucial top tips. Read More . Or, if you’re experiencing issues with Spotify, read how to fix common Spotify problems Spotify Not Working? How to Fix 8 Common Spotify Problems Spotify Not Working? How to Fix 8 Common Spotify Problems Like every other service known to man, Spotify is prone to problems that afflict millions of users. We have identified the most common problems, and found solutions for them all. You're welcome. Read More . And if you’ve had enough, here’s how to delete your Spotify account How to Delete Your Spotify Account How to Delete Your Spotify Account With all kinds of alternatives cropping up, you may be second-guessing whether Spotify is right for you. If you've had enough, you might want to delete your account. Read More . What’s funny is post Malone always streams himself playing call of duty ?? ?